Artwork details: gouache, 12 x 28.5 inches (30 x 72 cm), 2003. 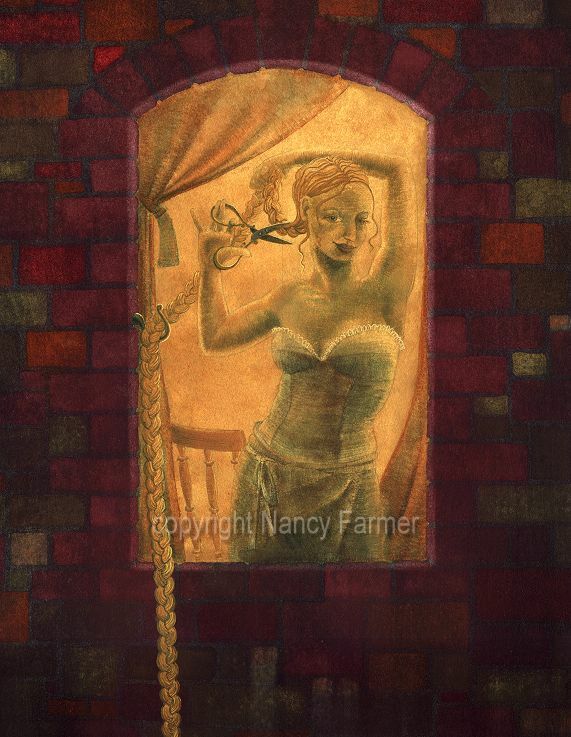 My Rapunzel is a modern woman - she's not hanging around in a tower all her life - she's off out. The only way she can escape this stair-less tower is of course to cut off her hair and use it as a rope with which to let herself down, rather nicely employing a common symbol of female liberation as she does so. Actually I always used to think Rapunzel was a bit dim - in the story I had as a child she asks the witch why she (the witch) is so much heavier on her hair when she climbs up the tower than the handsome prince, who also comes to visit her - of course this gives the game away and the furious witch throws her from the tower. It's a pretty stupid thing to say if you are planning a secret escape. Now, in the original collection of fairy tales that the Brothers Grimm published there was a slightly different story - Rapunzel actually asks the witch why her clothes no longer fit, and the witch looks at Rapunzel and sees that she is pregnant! (clearly no-one has explained a few basic facts of life to poor Rapunzel) This was though too racy and was changed in subsequent editions of the collection, but it makes a lot more sense, don't you think?